Income Tax software for the financial year 2016-17 and assessment year 2017-18 programmed by R.V.L.GANAPATHI RAO was ready now. This income tax software 2016-17 is useful to calculate your Income tax for the financial year 2016-17 and assessment year 2017-18, you can calculate your tax easily and most accurately. you can use personal proforma to fill your details easily here. I programmed this software as the best of my knowledge, minimum input and maximum output.Please give your valuable suggestions to improve this I T software for the assessment year 2017-18. Keep visiting this web page for updates in this software to calculate your Income Tax for 2016-17. 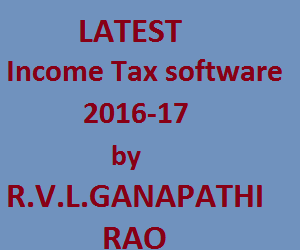 Download below your Income Tax software 2016-17 by R.V.L.GANAPATHI RAO. 1.P.H.C Alavanse : with holidays cutting or without holidays cutting option was given. 2. C.P.S additional contribution error fixed. 3.Dates and Years are modified in rent reciept. 6.E.H.F and G.I.S cuttings change option inserted. 7.CPS contribution amount Splitting under sec.80CCD(1b) option inserted. Download I.T Software 2016-17 with CPS amount Splitting option. sir please see annexure-2 in income tax software sheets. Thank you very much Mr.Santhosh Kumar. Please post your suggestions about this IncomeTax software.